St Brendans Park Fc are into the last 8 of the FAI Youth Cup with a fantastic win away against Regional United from Limerick on Sunday . After a scoreless 90 minutes the game went to extra time where both teams scored once each with Donagh O’Brien getting the Park Fc goal. In the penalty shootout the Park came out onto on a 4-3 score line. Tralee Dynamos are into the second round of the Greyhound Bar KO Cup where they will be away to Mastergeeha after they defeated Inter Kenmare on Sunday. John Farragher and Anthony Murphy were the Tralee Dynamos scorers . Castleisland Afc will face Listowel Celtic in the second round of the Greyhound Bar KO Cup after they defeated Killarney Athletic in their first round replay on Friday night. Tommy Feehan scored twice for Castleisland Afc with one each coming from Sean Brosnan, Pierce Brosnan and Matthew Browne. Killarney Celtic B are into the third round of the Dominos Pizza Reserve cup with a win over Ballyheigue Athletic B on Saturday night. 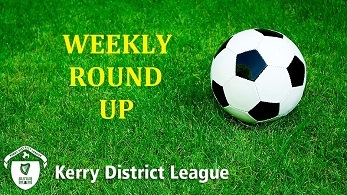 Conor McCarthy scored a hat trick for Killarney Celtic B with Mark Harnett and Aidan Galvin getting one each while Noel Carroll was the Ballyheigue Athletic scorer . Listowel Celtic B are up to eight with a win over Castlemaine United on Sunday morning. Jerry Kelliher and Brendan Angland were the Listowel Celtic scorers . Ballyhar Dynamos are up to sixth place with a home win over Killarney Athletic B on Sunday evening . Diarmuid O’Mahony scored twice for Ballyhar Dynamos with Niall Myers , Kevin O’Sullivan and Evan Cosgrove getting one each . Tralee Celtic are back on top of the division with a home win over Annascaul/Inch Fc on Sunday morning. Billy Stack , Aidan O’Sullivan and Stephen O’Sullivan were the Tralee Celtic scorers . Mitchels Avenue remain on top of the division with a home win over Sporting Listowel . Sean O’Reilly scored twice for Mitchels Avenue with one from Peter Murphy. Tom Mason was the Sporting Listowel scorer. Ballyheigue Athletic are still in second place with a win over Classic Fc on Sunday afternoon in Mounthawk Park. Frankie Flaherty scored twice for Ballyheigue Athletic with Kieran O’Connor getting one. Abhann Li remain in fourth place with a the aid of a walkover from Castlemaine United B on Sunday. CS Abbeydorney are in fifth place after a big win at home against Inter Kenmare B on Sunday. Eoghan Dillane scored four goals for CS Abbeydorney with Terry Carmody getting two wile Tommy Hayes got one. Windmill United extend their lead at the top of the division with a win over Lixnaw Fc with Kieran Hurley getting both goals. AC Athletic and Killarney Athletic couldn’t be separated on Wednesday night in the New Yorkers Over 35 league with Jason Griffin scoring for AC Athletic. Killorglin are into second place in section A with the aid of a walkover from Killarney Athletic on Saturday. Fenit Samphires secured their spot in the league semi final stage with a win over AC Athletic on Saturday afternoon in Mounthawk Park .